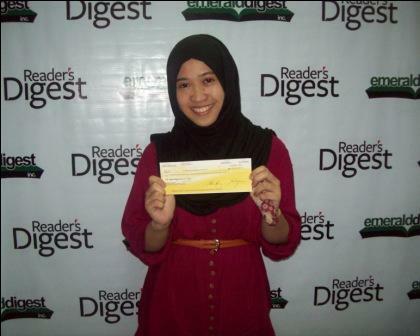 Reader’s Digest handed over the cheque worth US$5,000 to Nasibah Abdulfattah, the Filipino winner of the Click4cash August draw. Nasiba Abdulfattah, 21 years old from Marawi City, Lanao del Sur, is the lucky winner of this electronic raffle participated by residents of Singapore, Malaysia, the Philippines, Thailand, Hong Kong and Taiwan. She was accompanied by her mother and brother in the awarding. There is no required purchase to join the raffle. 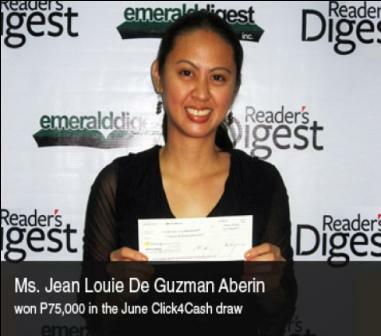 Individuals just need to visit the website of Reader’s Digest, follow the prompts on the promotional entry page, input the requested details and submit the fully completed entry. According to Nash, her nickname, she will use her cash winnings to pay the debts of their family, which were incurred to fund her college education. 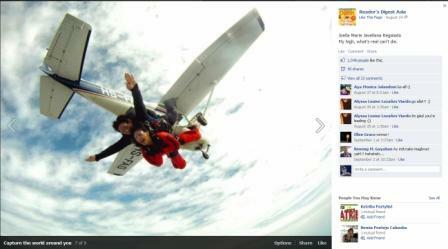 She also added that she will use the money in reviewing for the nursing board exam that she will take next year.